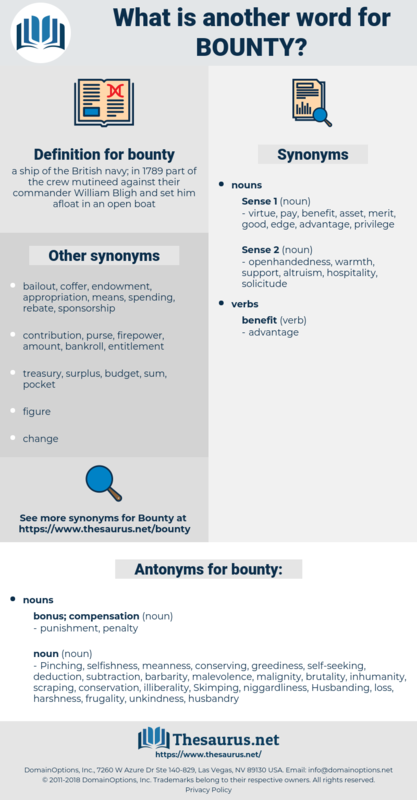 What is another word for bounty? Pinching, selfishness, meanness, conserving, greediness, self-seeking, deduction, subtraction, barbarity, malevolence, malignity, brutality, inhumanity, scraping, conservation, illiberality, Skimping, niggardliness, Husbanding, loss, harshness, frugality, unkindness, husbandry. When the grand - daughter returned loaded with the daily bounty from the Grove, we took our leave, followed by the prayers and blessings of the good woman. 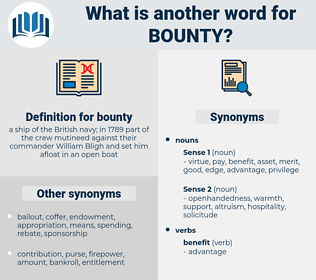 He replied, " If I have lived on their bounty, they know very well that they will not lose by it."